Also--congrats to ANNA, the winner of the Quiksilver Lulu's Scarf Giveaway! I'll be emailing you shortly. Thanks to everyone who entered and stay tuned for some AWESOME giveaways in the near future! p.s. This gorgeous feather clip was hand made by my friend LAUREN. She makes all sorts of cool necklaces/headbands/feather clips that are totally awesome if you're going for a hip, bohemian vibe. I add mine to an outfit when I want to add something interesting and unexpected...and every time I've worn it, I've gotten compliments ! Make sure to check out her shop, ECHOING WATERS! Yay! You put up the photos of the skirt. The color combo is definitely darker than usual and it does have a "vampy" look, but I like it! Something new! Love that the little kid called you a vampire! I would've been flattered as well I love the dark look of this outfit! Also, I love your friend's accessories! I'm thinking about ordering one of her earrings later on. Whoaaa I need a skirt like yours!! It's perfect. I love the look of the asymmetrical skirt on you. i am only 5'1 and i highly doubt it would look nice with my stubby legs. and i LOVE the boots. What a pretty skirt! And you styled it perfectly! It's funny I stocked up on high-low skirts this season, lol! lol little kids are crazy. 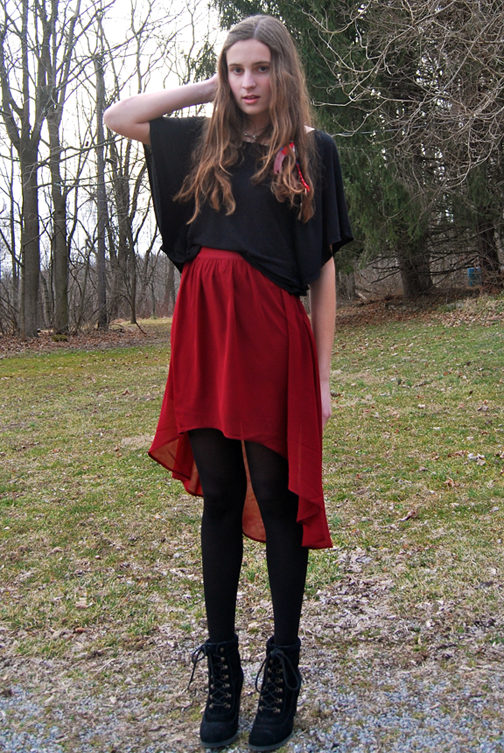 the skirt looks fantastic on you, and i guess you kind of have a dark, cool vampire look going. or not. haha <3 and thank you so much too!! Your skirt is just amazing! SO BEAUTIFUL! I LOOVE YOUR SKIRT! Loving this asymmetrical hi/low trend...perfectly paird with inky separates...very chic hun! hey there great blog!! I love your skirt! Where are you from? I am so in love with this look! It's so edgy and chic and well put together. The cut of the skirt/color and those shoes? KILLER. I would wear this every day if I were you! love that fishtail skirt! such a pretty color of red! Love this skirt!! Its gorgeous on you! And the feather hair clip is so fun!! Would love for you to checkout my latest posts and participate in my giveaway!! So pretty! Really love this look! That skirt is amazing! 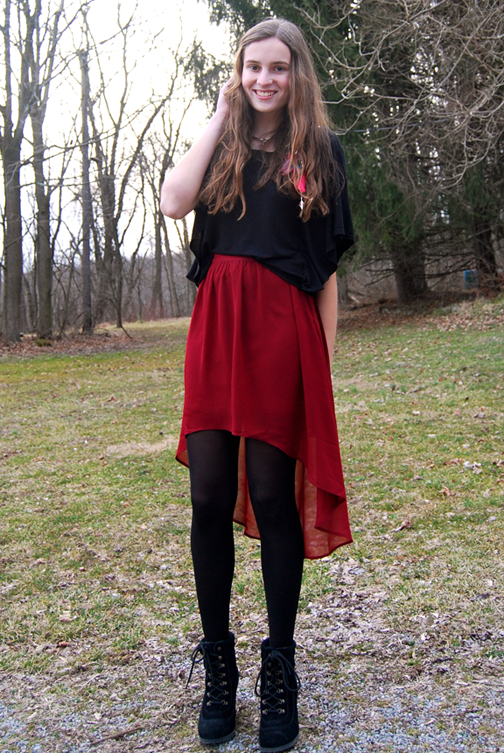 Love the red skirt and booties! Love your blog title! Super cute story!! Your skirt is great! haha, that's so cute. you must have really stood out then, and i might agree this outfit does look like vampire-inspired. i love the red skirt!!! you look great! What a lovely look! The cut of that skirt is beautiful! amazing pics - really nice blog. I would love for you to check out my new blog post. OMG! love your skirt! so gorgeous!!! wow, that outfit is gorgeous! amazing skirt babe! you look so beautiful with this skirt!!!! indeed not a vampire!!! you have such a great blog! let's follow each other on bloglovin!!!! just followed you! :) make sure to follow back! I really love this skirt! Beautiful color and its so whimsy. Ah, I love that skirt! 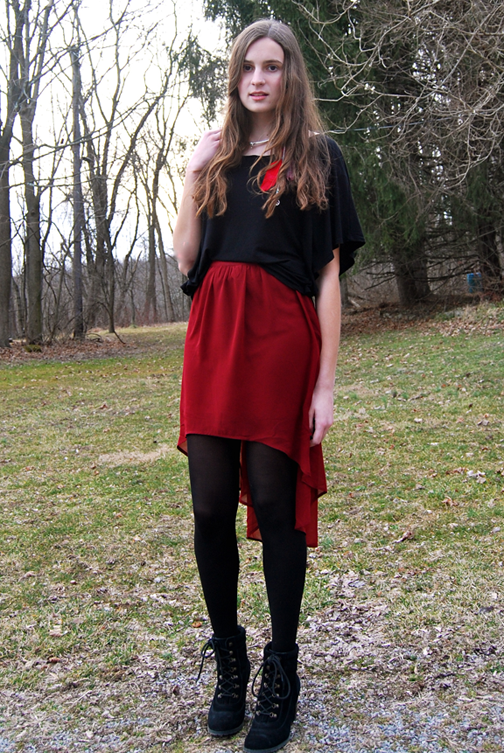 The color and asymmetrical hem are perfect! Oh wow, your red skirt is lovely! i totally missed the vampire comment, why did he call you that way? but love the red and black combo, its quite vampire-ish in the best kind of ways.